People know Elisabeth Moss by many names from her TV and movie roles: Offred, June Osborne, Peggy Olson, Zoey Bartlet, and Polly "Torch" Clark, to name a few. Yet facts about Elisabeth Moss reveal the woman behind these roles is as fascinating as her cinematic counterparts. Moss devoted herself to the craft of creating compelling characters. Whether you're familiar with her tour-de-force performance in The Handmaid's Tale or her seven seasons on Mad Men, you're likely aware of the talents of Moss the performer. Now let's look at Moss the person and her accomplishments, as well as some surprising facts about both her professional and private life, such as her rocky marriage to Fred Armisen. First, a brief Elisabeth Moss biography. Born in Los Angeles on July 24, 1982, she was an excellent student and has referred to her younger self as "serious, focused." Her mother is Linda Moss, an American musician, and her father Ron, also a musician, is a British citizen; as a result, Moss has both American and British citizenship. From an early age, Moss had plans to become a performer - she recognized her talent from the beginning. Moss met SNL comedian Fred Armisen in 2008; they got engaged four months later, and married in October 2009. By June 2010, they separated; two months later, Moss filed for divorce. It was a whirlwind courtship-marriage-split, and according to both Moss and Armisen, a terrible experience. Moss has called their union and subsequent breakup "extremely traumatic and awful and horrible." In an interview with Howard Stern, Armisen confessed to being a "terrible husband." Of her ex, Moss once said, "One of the greatest things I heard someone say about him is, 'He's so great at doing impersonations. But the greatest impersonation he does is that of a normal person.'" I feel it has given me a sanity and a stability that I am not sure that I would have necessarily had. It has taught me so much about the importance of communication. In my line of work, I am often in very stressful situations, in which you would often get totally nervous or clam up - you know, going on stage in front of 2,000 people. It's an applied philosophy. And L. Ron Hubbard definitely believed, and as Scientologists we believe, that the arts inject the spirit of life into our culture. Through her work on The Handmaid's Tale, a dystopian drama with major social and political commentary, Moss has become an unlikely activist. "I'm a staunch believer in women's rights," she told The Hollywood Reporter. "I don't really give a sh*t about anybody who isn't." Some have criticized Moss's advocacy efforts, however, since they feel her activist views contradict her faith. The Handmaid's Tale takes place in a secret, oppressive society - these adjectives also reportedly describe Scientology. Since Moss no longer comments on her religion, it's difficult to gauge if this public opinion has affected her. The Academy nominated Moss for an Emmy six times before she scored a win the seventh time for her work on The Handmaid's Tale, both as an outstanding lead actress and producer. She previously received five nominations for Mad Men, and once for Top of the Lake. 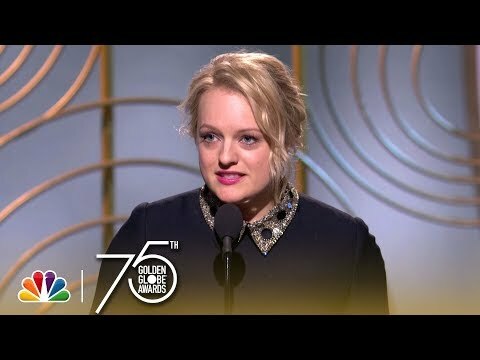 During her acceptance speech, she thanked her mother - and fabulously dropped an F-bomb in the process: "You have taught me that you can be kind and a f*cking badass."